Got this after thoroughly enjoying hearing Adrienne Dines speak at the 2008 London Convention. I had meant to read it immediately, but somehow it disappeared. It reappeard last week during a clear out of my far too cramped bookshelves. Anyway, to the book! My father grew up in a rural village in Kilkenny, and with every descriptive passage on village life, I could envision these exact events taking place in my Father's village. It is a warm and gentle tale of Ireland in the 60s, or so it would seem. The story is exactly as I have heard 1960s in Ireland told. A lot went on behind closed doors, and there was many a knowing nod and a wink, but things were never spoken about in public. Impure thoughts and confessing all, were paramount in people's priorities. Front row of the church on a Sunday, and the nuns frightening the living daylights out of you! I had guessed most of the missing jigsaw pieces, but there was one I hadn't guessed, so some intrigue right to the end. The Jigsaw maker was a nice plot to use to knit together the present and the past. 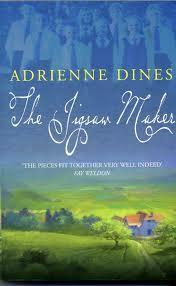 I will definitely read more Adrienne Dines' books in the future. Hello and congratulations! You have not only found yourself a good book, but a whole community of booklovers dedicated to sharing books with each other and the world at large. I hope you'll stick around a bit and get to know BookCrossing --maybe even make a journal entry on this book. You may choose to remain anonymous or to join (its free!) And if you do choose to join, I hope you'll consider using me, gizmopuddy, as your referring member. Feel free to read and keep this book, or to pass it on to a friend or even set it out "in the wild" for someone else to find like you did. If you do choose to join and journal, then you can watch the book as it travels- You'll be alerted by email each time someone makes another journal entry. It's all confidential (you're known only by your screen name and no one is ever given your e-mail address), free, and spam-free. Happy reading! I had decided to pick this book up at the Dublin Book crossing Convention last year in April. I hope to read it and release it while I'm in Europe for the next convention. Gave to 6of8 to read, hope she enjoys it! I do hope that whoever finds this reads it. It is a book full of characters waiting to come alive when you read about them. I hope you enjoy reading this book, and let this book continue traveling once you are finished with it. My niece passed this on to me to read on the way to the convention in Gothenburg. Loved this book - I could hear the author's voice from her presentation in Dublin. Very well-crafted story. Definitely recommend. Will add it to the table at convention. I caught this book at my first (and the books second) convention. Even though I actually managed to guess all of the jigsaw pieces I never found the book boring - not even predictable. If this authors other books are anywhere near this good I'll be happy to read them as well! I plan to release this book to the "favourite book buffet table" at the convention. I really enjoyed reading this book. It has a beautiful cover. Also, this will be this books third convention, and I really wish for it to be picked up and read by yet another bookcrosser. I saw this book at the Oslo Convention and put it into the Bookswap and was lucky enough to win it back. It wasn't the story I was expecting but I enjoyed it all the same. It is a story about how the misconceptions of childhood can affect adulthood.I went to college with a lot of Irish girls and could hear their voices as I read this book. It brought back a lot of happy memories for me, which would have pleased the jigsaw maker. A neat twist at the end. This is going off to another bookcrosser who asked to read it after me, so back to Norway it goes. Thank you for passing this book on to me. I really appreciate the fact that you sent it to me. It is always interesting to read the books that caught your attention at some point, and this one did intrigue me when I heard about it last year. Of course, I had forgotten everything I heard, and sort of started on scratch. The book has a nice enough story, even if I did not really buy that as an adult you would not see through your childhood misconceptions. There are some twists, however, they are very predictable. I did not really take to the books, nor the characters, these middle aged ladies acting like teenagers; getting upset at each others, holding grudges, not speaking to each other for days! Even so, thanks for sharing. På en benk utenfor - der bussene står!